Why a wine chiller stick? The Vivente Wine 3-in-1 Wine Chiller Stick claims to be the finest chiller, pourer and aerator all in one. I had never used a wine stick before, so I was curious as to how well it would work. When I took it out of the box, I was immediately impressed by the construction and design. It has a classy look. The wine stick is put into the freezer for a short time, perhaps two hours. That seemed to be enough time to properly chill the wine as it was poured through the stick. The wine was at a perfect temperature, though it had been slightly warmed prior to pouring. Aeration of wines is used to bring out the flavor and full essence of wine. It works to elevate the wine’s flavor by allowing oxygen to bring about that full flavor. Again, the Vivente Wine 3-in-1 Wine Chiller Stick performed perfectly, allowing the wine to develop that full bodied flavor for perfect enjoyment. Pouring wine using the wine chiller stick was equally easy. With no drips and a very even stream, the wine settled nicely into the wine glass for immediate enjoyment. The Vivente Wine 3-in-1 Wine Chiller Stick is a great multi-purpose tool that really does fulfill it’s description. 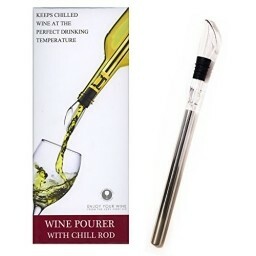 Whether you enjoy traditional wine or the alcohol free varieties, this Wine chiller stick is a great tool to help you serve your wine at its best. Highly recommended!